Catrice swatches - Up in the air & Sand Francisco | Memorable Days : Beauty Blog - Korean Beauty, European, American Product Reviews. I bought two nail polishes of Catrice (Ultimate Nail Lacquer) a while back. I have a large collection of Catrice nail polishes at home lol. I just love nail polishes of this brand because the colors are lovely, it's inexpensive and it's of good quality. 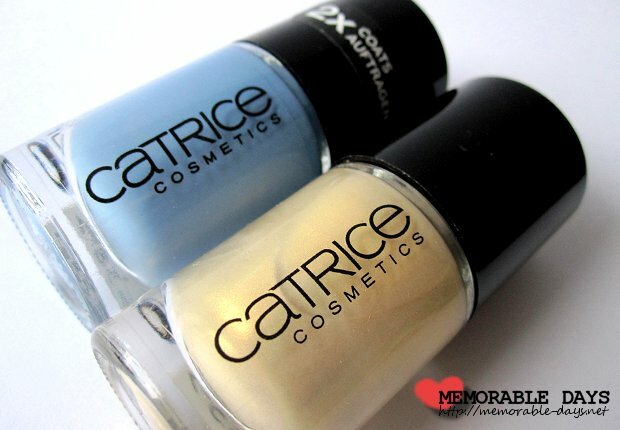 Catrice has a couple of blue nail polishes in their assortment. 5 to be exact and I have 2 out of the 5. The other one that I have is called #540 Am I Blue or green, click on the name to watch a swatch of the nail polish. The nail polish Up in the air is a bit darker compared to Am I Blue or green, but it's still suitable for the summer. The color of the nail polish Up in the air is slightly different in the pictures than in real. These are sold at the Dutch drugstore, Kruidvat. They are €2,49 each which is a great price! The brushes are black and as you can see in the picture below, the brush from #530 Up in the air is a bit larger than the other one. I liked the larger brush more though, it was easier to apply and it wasn't streaky while I applied it. Two coats were needed to get a good finish. Sand Francisco on the other hand was quite sheer, streaky and I even needed 3 coats to get a "good finish" (it was still streaky after wards). I like both colors! Which one do you like? I like them both very pretty. ahh I love both colours! i like long nail polish brush, so that it can reach the bottom! nice gold!